This life is full of disappointments and gut-wrenching circumstances. Something bad happens every time we turn around and we’re left to deal with it. How we react can affect not only us but those close to us. However, it’s okay not to be okay. We can still be joyous . . . even in the darkness. Sheila Walsh nails it in It’s Okay Not to be Okay. This book is full of truths and God helps on dealing with the circumstances in life. The author shares stories in each of the chapters, so this book not only encourages the reader but also entertains. I laughed at some of them and was sorrowful at others. She knows what she’s talking about and brings home her points effectively. She encourages the reader to take the first step and tell God everything. He knows but wants us to admit how we’re feeling. It’s okay to go through the emotions. After that, we need to learn to let go and give God the control. This book is beautifully written. It kept me turning the pages to find out more. At the end of each chapter, she concludes with practical steps in the One Step at a Time section. Brilliant! 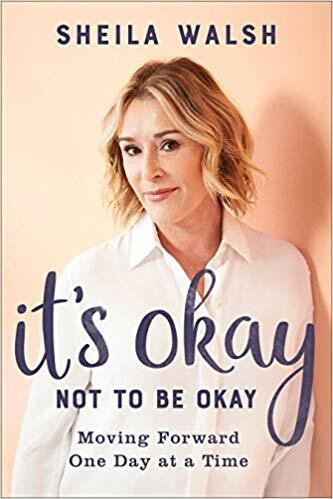 I give It’s Okay Not to be Okay five stars. I guarantee the reader will be encouraged after reading this book. Sounds really intriguing Darlene. Would love to read it! It’s a great book. Your name is in the draw! Thanks for stopping by. Hi Darlene….I’ve been waiting on your review as I love Shelia Walsh and would like to read her book. Hi, Kathy!! So great to hear from you. It’s an awesome book. Your name is in the draw! Thanks for stopping by. It’s good to read, & be reminded, that I can tell God everything!